A printable pdf of the map can be downloaded from here. Maps are also available from Selsdon Library. Over 80 name boards and plaques have been erected by the Friends of Selsdon Woods to mark features and footpaths and help visitors find their way around the woods. Of these, 57 name boards and one finger post were installed in 2011, purchased with the help of a London Tree and Woodland grant and a further 23 name boards were added in 2012 in addition to 2 plaques with information about the Jubilee and Centenary Plantations. We hope these signs will encourage you to explore the wood – there is lots to enjoy, even in winter. 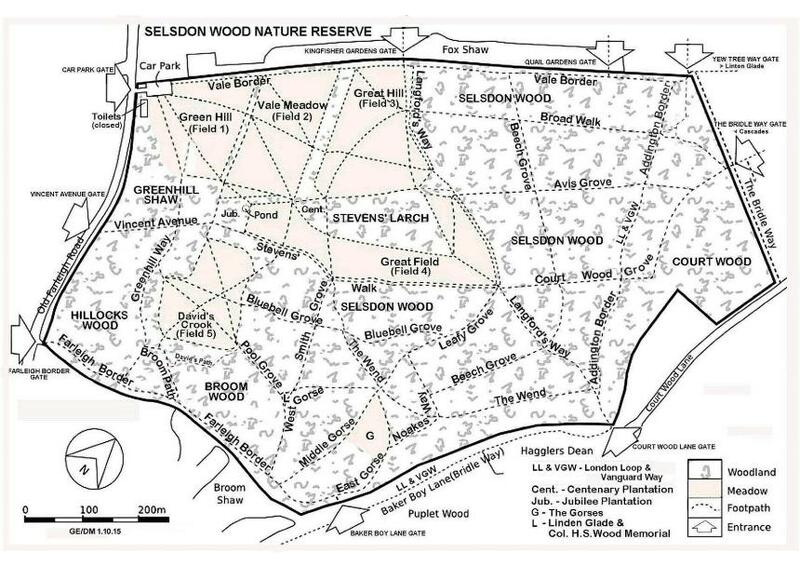 You may be interested in the derivation of some of the names used in Selsdon Wood. ADDINGTON BORDER – marks the old boundary between the Archbishop of Canterbury’s Addington estate and Croydon. FARLEIGH BORDER – marks the present outer boundary of Croydon. VALE BORDER – marks the border with Selsdon Vale. Several of them commemorate past owners of the Selsdon Wood estate. Full details of the history of the wood can be found on the History page. (Please forgive us for missing appropriate apostrophes from the sign boards but each character costs more). SMITH GROVE – The Smith family, well known Sanderstead landowners, owned the land from the early 1800s until 1890. STEVENS WALK – W. Stevens, a printer, owned it from 1890 to 1899. NOAKES WAY – W. Noakes, a brewer, owned it from 1899 to 1923. The next owner was only interested in selling off Selsdon Wood for development, so we did not feel justified in commemorating him. Happily the site was preserved for posterity in 1935, when it was bought by generous public, local government and local organisations’ donations and presented to the National Trust. VINCENT AVENUE – relates to the Lord Mayor of London, Sir Percy Vincent, who performed the official opening of Selsdon Nature Reserve in 1936. LANGFORDS WAY – marks a favourite walk of Mr Langford, a farmer, whose Selsdon Park farm occupied the present Aldi site. GREENHILL WAY – Greenhill Shaw which is at the top of the first car park field. AVIS GROVE - marks the bird connection. LINDEN GLADE – (see photograph below taken in autumn 2011) Linden is an old poetic name for the Small-leaved lime trees which were ancient members of the Wild Wood and were almost certainly replaced in Selsdon Wood by Hazel trees. EAST, MIDDLE & WEST GORSE – are named for a large field that used to be covered with cultivated gorse but was taken over mostly by larch trees. Part of this area has been cleared and old gorse seeds have germinated restoring the area now named THE GORSES to its former glory. CENTENARY PLANTATION – in 1983, one hundred oaks were planted to commemorate the centenary of Croydon Council. JUBILEE PLANTATION – this celebrates the 1977 Silver Jubilee of Her Majesty the Queen. It was paid for by Croydon Girl Guides Association. In 2012 Brownies and rainbows carried out a further planting to mark the Diamond Jubilee. One name commemorates a feature – POOL GROVE - This leads to Linden Glade where there is a pool. Years ago it was fed by mains water but this was disconnected some years ago as it was too expensive to maintain. The pool then dried up and filled with mud but it has now been restored by FSW. See the Projects page for details. Field 1 GREEN HILL maintains its ancient name. Field 5 DAVID'S CROOK maintains its ancient name. Unfortunately, the source of some names remains shrouded in mystery.